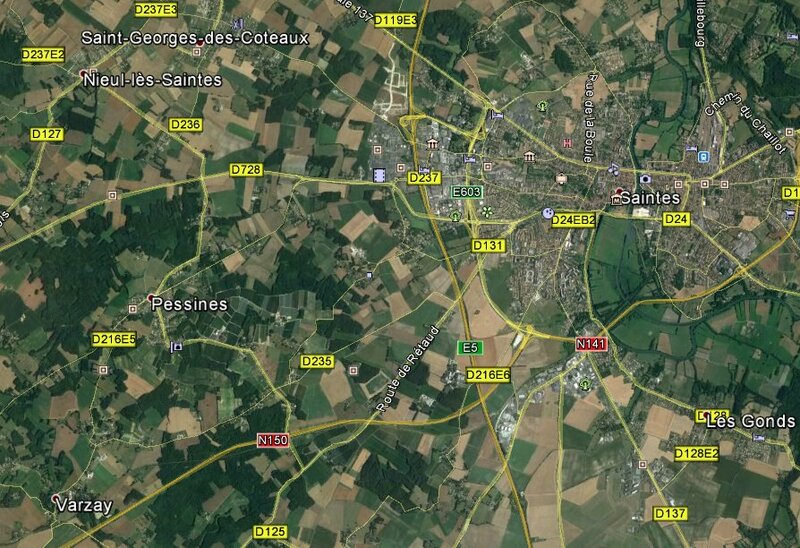 Reference number for this case: 18-oct-54-Saintes. Thank you for including this reference number in any correspondence with me regarding this case. The case apparently appeared in the national Press, France-Soir and Paris-Presse, for October 20, 1954. It was published by Jimmy Guieu, Aimé Michel and Charles Garreau in the ufological literature. The version of Guieu in 1956 is that on October 19, 1954, at 9 p.m. near Saintes in the Charente-Maritime, Mr. Labassière and his wife saw in the sky an "object" in the form of balance which was "waddling" at low altitude. The "scourge" of this "balance" was of a dazzling green; one of the trays was red, the other orange. After being immobilized, the two discs detached to land in a field. Two small beings then left each apparatus, walked towards each other, and after crossing, changed craft. The two "spacecraft" then resumed their initial position, connected in flight by a powerful luminous beam and "fled in a blinding flash." Aimé Michel indicated in his 1958 book that in the night of October 18, 1954, at 09:00 p.m., Mr. and Mrs. Labassière were driving by car from Saintes to Royan, on national road 150 going from East to West in this sector. "Suddenly we saw, flying at a rather low altitude, a scales-like object waddling in the sky, one "tray" was orange, the other red, and they were joined by a trail of a green color. It was the oscillation, the "waddling," of the two objects that suggested the image of a balance, and the two objects soon came to land near us." "After a few seconds, the luminous "scourge" that united the two objects disappeared, and they settled separately not far from each other in a neighboring field. We soon perceived, moving in the vague luminosity of each craft, two crew members, two small beings, they headed towards each other, crossed each other without stopping, and exchanged their vehicle, the two balls then ascending into the sky in a vertiginous acceleration. In few seconds, they disappeared on the horizon." Aimé Michel reports that there was an investigation that revealed that several other motorists on national road 150 had also seen the phenomenon, without witnessing the maneuver on the ground with the two beings, an episode of the observation only witnessed by Mr. and Mrs. Labassiere. Based on Press clippings, Charles Garreau noted in the 1970s that on October 18, 1954, at 9:00 p.m., Mr and Mrs Labussieres from Royan had just left Saintes and had traveled a few kilometers by car when they saw a luminous object in the form of a balance in the sky, waddling a few hundred meters from them. "One of the trays was orange, the other red, and they were united by an intense green light bar, and as we watched them they came to rest above the country, and stopped. After a few seconds, the luminous bar that united the two objects disappeared, and they landed in a nearby field, emitting a vague light. Almost simultaneously, a small being came out of each of these craft. They headed towards each other, met without stopping and returned to the craft. Immediately after this exchange of pilots, the two balls rose up to the sky, with an incredible acceleration, and they disappeared in seconds." Garreau added that after the exchange of the pilots, the luminous bar linking their two craft did not reappear. Jimmy Guieu indicates that on October 19, 1954, at 9 p.m. close to Saintes in the Charente-Maritime, Mr. Labassière and his wife saw in the sky an "object" in the shape of balance which "was dandled" at low altitude. The "axis" of this "balance" was of a dazzling green: one of the plates was red, the other orange. After becoming motionless, the two discs were detached to come to land in a field. Two small beings then came out of each apparatus, walked one towards the other, and after having crossed, switched machines. The two spacecraft then took again their initial place connected in flight by a powerful beam of light called "axis" by the observers and then fled in a dazzling flash. Aimé Michel indicates in his book that on the evening of October 18, 1954 at 09:00 P.M., in middle of the night, in the department of the Charente-Maritime at the edge of the department of the Vendée Sud, Mr and Mrs Labassière were driving in their car on National Road RN 150 which is directed from the East towards the West in this sector. The Labassières were driving from Saintes to Royan. "Suddenly we saw, flying at a rather low altitude, an object in the shape of balance which was dandled in the sky. One "plate" was orange, the other was red, and they were joined together by a trail of luminous green. It is the oscillation, the "wobbling," of the two objects which suggested to us the image of a balance. The whole of the two objects was soon motionless not far from us above the countryside." "After a few seconds, the luminous "plague" linking the two objects dissipated, disappeared, and they landed separately not far one from the other in a nearby field. We soon saw two beings of small size moving in the vague luminosity of each of the two machines. The two "crew" moved one towards the other, crossed without stopping, and switched vehicle. The two balls went up then in the sky in a vertiginous acceleration. In a few seconds they disappeared at the horizon." Aimé Michel reports that the investigation allowed to discover that several other motorists on the RN 150 road had also seen the phenomenon, without seeing the operation on the ground with the two beings, seen only by Mr and Mrs Labassière. The authors say that one of the most puzzling incidents involving occupants took place at about 9 p.m. on the evening of October 18, 1954, in France. 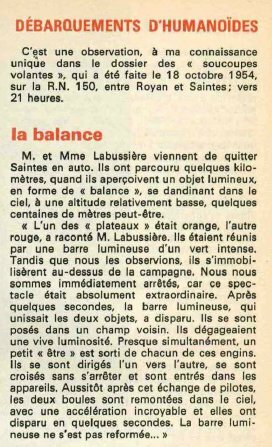 Mr. and Mrs. Labassiere of Royan, France, were driving on Route N-50 when they saw an object "shaped like a balance" at low altitude in the sky. One of the "pans" of the balance was orange, the other was red, and they appeared to be linked by a trail of luminous green. The whole apparition was swaying or "bouncing." Shortly the two "pans" stopped and hovered above a field not far from the witnesses. The two sat spellbound as the luminous beam uniting the two objects faded and disappeared, and the objects landed separately, but just a short distance apart. In the dim light emanating from the objects, the Labassieres saw two very small creatures which approached each other, passed without stopping and changed vehicles. Then the two ball-like objects vaulted into the sky at a dizzying speed and disappeared over the horizon within seconds. The authors comment: "What is outstanding about this incident is the obvious fact that the pilots or occupants of two vehicles changed crafts." And: "The puzzling aspects are the luminous green beam or whatever it was, which connected the two vehicles, the possible reason for the exchange, and whether or not the "beam" had something to do with the exchange. Inasmuch as this is the only incident of its kind, and the two objects with their connecting beam were seen by many others on the night in question (although without the added detail of the creatures and the exchange of crafts), this would seem to indicate that the sighting was a real one of a real object or objects, and leads one to conjecture on the meaning of the "beam." Was it a means of communication, or possible power exchange? Was one "pilot" relieving another who had been "on duty" for a considerable period of time? This might seem to be the answer, but it does not account for the exchange of craft. for they seemed to be identical. Could one have been having mechanical trouble, so that a replacement was delivered?" With personal files and newspaper clippings, the authors expose the case of a UFO observation in Royan, in the Charente-Maritime, on October 18, 1954. On this date and at 09:00 P.M., two motorists of Royan, Mr. and Mrs. Labussières, came to leave Saintes and had traversed a few kilometers, when they saw a luminous object in the shape of a balance in the sky. The object dandled at approximately a few hundreds of meters. "One of the plates was orange, the other red. They were joined together by a luminous bar of an intense green. While we observed them, they became motionless above the countryside. We stopped at once, because this display was absolutely extraordinary! After a few seconds, the luminous bar which linked both objects disappeared. They landed in a nearby field, emitting a vague luminosity. Almost simultaneously, a small being came out of each of these machines. They moved one towards the other, crossed without stopping and returned in the apparatuses. At once after this switch of pilots, the two balls went up in the sky, with an incredible acceleration, and they disappeared in a few seconds." The authors note that after the exchange of the pilots the luminous bar connecting their apparatuses did not reappear. It is an observation, to my knowledge unique in the "flying saucers" file, which was made on 18th October 1954, on R.N. 150, between Royan and Saintes; around 9 p.m.
Mr. and Mme. Labussiere had just left Saintes by car. They drove a few kilometers, when they perceived a luminous object, in the form of a "balance," waddling in the sky at a comparatively low altitude, perhaps a few hundred meters. "One of the "trays" was orange, the other red," said Mr. Labussiere. They were joined by an intense green light bar. As we watched them, they came to rest above his country. We immediately stopped, because the show was absolutely amazing. After a few seconds, the luminous bar, which united the two objects, disappeared. They landed in a nearby field. They emitted a bright light. Almost simultaneously, a small "being" emerged from each of these craft. They went towards each other, met without stopping and entered the craft. Immediately after this exchange of pilots, the two balls are reassembled in the sky, with an incredible acceleration and they disappeared in a few seconds. The luminous bar was not reformed..."
4) On the R.N. 150, between ROYAN AND SAINTES, on October 18, 1954, at 9 p.m.; References: newspaper clipping, personal files. "One of the "plate" was orange, the other red, they were joined by a luminous bar of intense green color, and as we watched, they stopped over the countryside. We immediately stopped, because this show was absolutely extraordinary. After a few seconds, the luminous bar that joined the two objects disappeared. They landed in a nearby field, giving off a luminous glow. Almost simultaneously, a small being came out of each of these craft. They went towards each other, crossed each other without stopping and entered into the craft, and immediately after the pilots' exchange, the two balls went up in the sky, with incredible acceleration and they disappeared in a few seconds." This landing is located 7 kilometers from the corridor, but also 43 kilometers from the one in Soubran. Michel Carrouges lists as a case with small occupants but lacking details the Labassière case, near Saintes in the Charente-Maritime on October 11, 1954. He indicates that while the sighting of the strange apparatus' is remarkable, while the witnesses indeed saw the two saucers and four small beings, they do not provide details on the equipment of the beings. Mr. and Mrs. Labassiere and other witnesses saw two disks in the sky, one orange and the other red, with a sort of luminous "bridge" between them. They landed, and one dwarf came out of each craft and went into the other without any sign. After this exchange of pilots both objects flew away with a tremendous flash. (P 74). Mr. and Mrs. Labassiere and other witnesses saw two disks in the sky, one orange and the other red, with a sort of luminous "bridge" between them. They landed, and one dwarf came out of each craft and went into the other without any sign. After this exchange of pilots both objects flew away with a tremendous flash. (France-Soir, Paris-Presse, Oct. 20, 1954). The authors indicate that on October 18, 1954, as reported in the Aimé Michel book Flying Saucers and the Straight Line Mystery, Michel that he found a quite amazing coincidence between a Haute-Loire case and a Vendee incident. One of them occurred in the Charente-Maritime at 09:00 p.m. as Mr. and Mrs. Labassiere, of Royan, were driving from Saintes to Royan on Route N-150, where noticed a balance-shaped object in the sky. One of the "pans" was red and the other orange, and there was a trail or rod-shaped affair of a luminous green color between them. The entire apparatus was "bouncing," making the Labassieres think of a balance. Shortly after it was first noticed, the object stopped above a field not too far from the observers, and they stopped to watch. After the objects had hovered over the field for a few seconds, the green beam which united them faded and disappeared, and the two objects landed not far from one another. Soon, in the dim light emitted by the two objects, a very small creature was seen coming out of each object, walking toward each other, passing one another without stopping, and getting in the other end of the object, as if they changed craft. Then the two "balls" went up into the sky in a "dizzy acceleration" and were out of sight over the horizon within seconds. Aimé Michel investigated the case and found out that several other people on Route N-150 had seen these objects, although they did not see the landing or the swapping of craft as the Labassieres had. 062 18/10/1954 21.00 between Royan and Saintes. 17 Labassiere. "We saw, flying at a low altitude, a luminous object in the shape of a balance. It is the wobbling of the two objects which suggested us the image of a balance." After a few seconds, the luminous plague linking the two plates dissipated, disappeared. They landed on the ground not far from the witnesses who saw two beings of small size in the luminosity of each of the two machines. The two crews moved one towards the other, cross without stopping and change apparatus. The two balls then take off then in a vertiginous manner and disappear in a few seconds. The sources are indicated as case 285 of the Vallée catalogue; Aimé Michel in "A Propos des S.V." page 234; Jimmy Guieu in "Black-Out sur les S.V." page 234; C. Garreau and R. Lavier in "Face aux E.T." page 156; Quincy; France-Soir and Paris-Presse for October 20, 1954. A pair of UFOs flew over a busy French highway, Route N150, at 9:00 p.m. October 18th. The two UFOs seemed to be connected by a "luminous bridge" according to those who paid attention. Two witnesses, whether they were motorists is not given in the account, M. and Mme. Labassiere, said they observed the pair of objects set down in a field where two "dwarf-like" beings emerged, one from each craft. The beings re-entered different objects, giving the impression the ships had landed with the purpose of exchanging personnel. After this "switch," the two UFOs zoomed away, and while doing so, emitted a tremendous flash. 148. Coral Lorenzen's source is more descriptive, saying that the objects were flat, like pans, and that the overall impression of the arrangement was like that of a balance with one "pan" orange and the other red. The "bridge" was a luminous green beam of light. The entire apparition swayed or bounced as it moved toward the ground. 149. 149. Lorenzen, Coral and Lorenzen, Jim. UFOs:Flying Saucer Occupants, p.98. The authors indicate that on October 18, 1954, in Royan, France, a couple watched two ball-shaped abjects that appeared to be joined by a bright beam of light. When the light went out, the two abjects landed separately. A small creature got out of each craft and entered the other craft. Bath ships then took off and flew away. 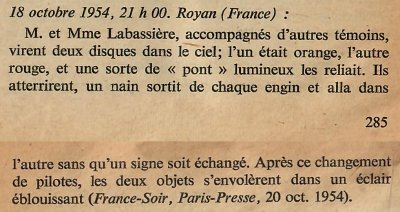 The author indicates that on October 18, 1954 at 09:00 p.m. on the N150 between Saintes and Royan, Mr. and Mrs. Labassière, or Labestière according to other sources, drove by car when they suddenly saw a luminous object in the shape of a balance swinging at low altitude. One of the plates of this "balance" was red and the other orange. After a few seconds the object landed in a nearby field. Two small beings came out of each plate, crossed, thus exchanging plate. Then the whole thing took off and was lost from sight in the sky. These authors indicate, without giving either date or source, that near Saintes, in the Charente-Maritime, France, a vessel in the form of a "scale" was seen by the Labassière couple "waddling" at low altitude. Mr. and Mrs Labassiere were driving to Royan on Route N 150 when they noticed, at a rather low altitude, an object shaped like a pair of scales which was rocking in the sky. One “pan” was orange luminous, the other red, and they were united by a trail of luminous green. The object stopped, the luminous beam faded out, and both objects landed on a nearby field. Then they saw 2 very small creatures, which went toward each other, passed, and exchanged vehicles. The bells then took off at a "dizzy" acceleration and disappeared in a few seconds. The Belgian ufologist indicates that in 1954, on October 18, in France, "in Royan (or close to Saintes) ", "The Labassières and other people saw around 21 hours two discs in the sky: one was orange, the other red and a kind of green luminous bridge connected them. They landed, a dwarf left each machine, and went in the other without exchanging a sign. After this change of pilots, the two objects flew away in a dazzling flash." The sources are indicated as "France-Soir, Paris-Presse, 20 oct 1954" et "Jacques Vallée: 'Chronique des apparitions ET' - DENOEL 1972 - J'AI LU COLL. - p. 285, 286". She quotes: "We saw, flying at low altitude, a luminous object in the shape of a balance. It is the wobbling of the two objects which suggested us the image of a balance" the motorists reports, who stop to see what it is. After a few seconds, the luminous rod linking the two plates is dissipated, disappears. They are posed on the ground not far from the witnesses who see in the luminosity of each of the two machines, two beings of small size (thus: 4 beings on the whole). The two crews move one towards the other, cross without stopping and change apparatus. The two balls then take off in a vertiginous manner and disappear in a few seconds." The source of the quote is given as "FIGUET/ J.L. RUCHON: 'Ovni, premier dossier complet...' - Alain Lefeuvre pub. 1979, p. 187, 188". A couple saw two ball-shaped objects that appeared to be joined by a beam of light. When the light went out, the objects landed separately. A small creature got out of each craft and entered the other craft. Both ships then took off. 21:00 In Royan (France), Mr. and Mrs. Labassière, accompanied by other witnesses, see 2 discs in the sky, one orange, the other red, and a kind of luminous "bridge" connecting them. They land, a dwarf leaves each machine and went in the other without a exchanging a sign. after this change of pilots, the 2 objects fly away in a dazzling flash. The sources are indicated as "France-Soir, Paris-Presse, 20 octobre 1954". Jerome Beau indicates that on Monday, October 11, 1954, "at nightfall in Royan, 3 residents of Bordeaux see a red gleam above the hill. They advance towards the phenomenon and distinguish an object in the shape of a disc, with an orange red dome, which hovers ten meters of the ground. A little further, the residents of Bordeaux surprise 4 creatures of 1 m in height, squatted under the apparatus. The latter reinstate in haste their craft, which takes off while changing color." Luc Chastan indicates that in the Charente Maritime in St Romain de Benét (estimated place) on October 18, 1954 at 21:00 hours "a couple is in a car on the road between Saintes and Royan." "'Suddenly, whereas we drove on the N150, we saw, flying at low altitude, a luminous object in the shape of a balance a plate orange, the other red, and joined together by a trail of a luminous green. It is the wobbling of the two objects which suggested us the image of a balance' the two motorists who stop to see what it is. After a few seconds, the luminous "rod" linking the two plates is dissipated, disappeared, and they landed on the ground, not far from the witnesses who see moving, in the luminosity of each of the two machines, two beings of small size. The two crews move one towards the other, cross without stopping and change apparatus. The two balls then take off vertiginously and disappear in a few seconds at the horizon.'" The website indicates that on 18 October 1954 at 21:00 in Royan, France, "Two disks landed, and one dwarf came out of each craft. Explanation: Planet." "In Royan, France Mr. and Mrs. Labassiere and other witnesses saw two discs in the sky at 9:00 p.m, one orange and the other red, with a sort of luminous 'bridge' between them. They landed, and one dwarf came out of each craft and went into the other without any sign. After this exchange of pilots both objects flew away with a tremendous flash." And: "Mr. and Mrs. Labassiere and other witnesses saw two disks in the sky, one orange and the other red, with a sort of luminous "bridge" between them. They landed, and one dwarf came out of each craft and went into the other without any sign. After this exchange of pilots both objects flew away with a tremendous flash." And: "Close encounter with a an unidentified craft and its occupants." "Two orange-red saucers, about 20 feet across, were observed by two witnesses, a married couple, on a highway for ten minutes. Two 4-foot-tall tiny beings were seen." And: "Mr. and Mrs Labassiere were driving to Royan on Route N 150 when they noticed, at a rather low altitude, an object shaped like a pair of scales which was rocking in the sky. One "pan" was orange luminous, the other red, and they were united by a trail of luminous green. The object stopped, the luminous beam faded out, and both objects landed on a nearby field. Then they saw 2 very small creatures, which went toward each other, passed, and exchanged vehicles. The bells then took off at a "dizzy" acceleration and disappeared in a few seconds." The source are indicated as Webb, David, HUMCAT: Catalogue of Humanoid Reports; Guieu, Jimmy, Flying Saucers Come from Another World, Citadel, New York, 1956; Lorenzen, Coral E., Flying Saucer Occupants, Signet T3205, New York, 1967; Lorenzen, Coral E., UFOs: The Whole Story, Signet T3897, New York, 1969; Lorenzen, Coral E., Encounters with UFO Occupants, Berkley Medallion, New York, 1976, ISBN:425-03093-8; Bowen, Charles, The Humanoids: FSR Special Edition No. 1, FSR, London, 1966; Pereira, Jader U., Les Extra-Terrestres, Phenomenes Spatiaux, Paris, 1974; Vallee, Jacques, Computerized Catalog (N = 3073); Vallee, Jacques, Challenge to Science: The UFO Enigma, Henry Regnery, Chicago, 1966; Vallee, Jacques, Preliminary Catalog (N = 500), (in JVallee01); Vallee, Jacques, A Century of Landings (N = 923), (in JVallee04), Chicago, 1969; Schoenherr, Luis, Computerized Catalog (N = 3173); Carrouges, Michel, Les Apparitions de Martiens, Fayard, Paris, 1963; Olsen, Thomas M., The Reference for Outstanding UFO Sighting Reports, UFOIRC, Riderwood, 1966; Delaire, J. Bernard, UFO Register Volume 7 (1976), Data Research, Oxford, 1976; Hatch, Larry, *U* computer database, Author, Redwood City, 2002; Rosales, Albert, Humanoid Sighting Reports Database. A number of motorists on Route N-150 saw two discs in the sky, one orange, the other red, with a sort of luminous bridge between them. Mr and Mrs Labassiere saw them land in a nearby field. One dwarf came out of each craft and went into the other one, without any communication between them. After this exchange of occupants both objects flew away with a tremendous flash. Vallee Case 285, citing France-Soir + Paris Presse 21 October 1954. Heiden citing Carrouges 1967, p,319. 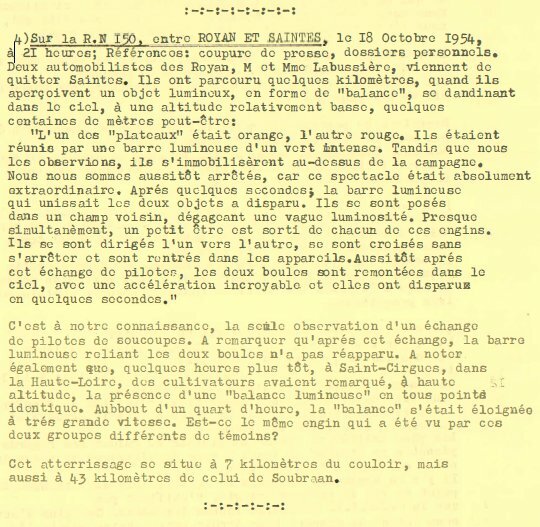 The author indicates that there was a CE3 case between Saintes and Royan, in the Charente-Maritime, on October 18, 1954, at 09:00 p.m..
Mr. and Mrs. Labassière were driving on the N150 when they saw a luminous object in the shape of a scale flying at low altitude, with one orange plate, the other red, joined together by a trail of a luminous green. The wobbling of the two objects suggested to the witnesses the image of a scale. They stopped to see what it was. After a few seconds, the luminous "rod" linking the two plates was dissipated, disappeared, and the plates landed on the ground not far from the witnesses who saw moving in the luminosity of each of the two machines, two beings of small size. The two crews moved one towards the other, crossed without stopping and changed apparatus. The two balls then took off vertiginously and disappeared in a few seconds at the horizon. The sources are indicated as Aimé Michel, "Mystérieux Objets Célestes", pages 325-326; Jimmy Guieu: "Black out sur les Soucoupes Volantes", page 198; C. Garreau and R. Lavier, "Face aux Extra-Terrestres", page 156; Michel Figuet and Jean-Louis Ruchon, "OVNI: le premier dossier complet des rencontres rapprochées en France", pages 187-188; Jean Sider, "Le dossier 1954 et l'imposture rationaliste", page 210; France-Soir, Paris-Presse for October 20, 1954. Mr. & Mrs Labassiere were driving to Royan on Route N 150 when they noticed, at a rather low altitude, an object shaped like a pair of scales which was rocking in the sky. One “pan” was orange luminous, the other red, and they were united by a trail of luminous green. The object stopped, the luminous beam faded out, and both objects landed on a nearby field. Then they saw 2 very small creatures, which went toward each other, passed, and exchanged vehicles. The bells then took off at a “dizzy” acceleration and disappeared in a few seconds. 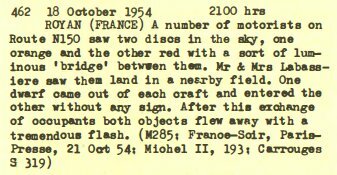 *Oct. 18, 1954 – In Royan, Charente-Maritime, France Mr. and Mrs. Labassiere and other witnesses saw two discs in the sky at 9:00 p.m., one orange and the other red, with a sort of luminous "bridge" between them. They landed, and one dwarf came out of each craft and went into the other without any sign. After this exchange of pilots both objects flew away with a tremendous flash. (Sources: Aime Michel, Flying Saucers and the Straight Line Mystery, p. 193; Jacques Vallee, Passport to Magonia: A Century of Landings, p. 233, case 285). Two unidentified witnesses observed two brilliant disc shaped objects suspended near the ground, several meters from one another. Two little men about the same size as a 12-year old were seen approaching one another as if to converse; they then separated, each one returning to its prospective vehicle, into which both seemed to “melt.” The figures seemed to be dressed in aluminum outfits. No further details were noted, as the witnesses were approximately 400 meters distant. After the entities disappeared into the objects, they ascended and flew off at very high speed. This database recorded this case 16 times! Vallee Case 285 citing France-Soir + Paris Presse 21 October 1954. The witnesses name is likely either Labassières or Labussière, it is unlikely to be Labassière or Labussières. From Saintes, by the RN 150, Royan was at about 36 kilometers. We are actually told that the witness just left Saintes, that it happened "near Saintes". The case is thus close to Saintes, in the drection to Royan, not "between" Saintes and Royan in the sens of "in the middle" of the travel. As of the observation, I can see no prosaic cause that could match what was described. The question of the credibility pf the report remains open. I have a hard time assessing it as for now I do not have the cited Press sources. [---] Article in the national newspaper France-Soir, Paris, France, October 20, 1954. [am1] "Mystérieux Objets Célestes", book by Aimé Michel, Seghers publisher, France, pp. 256-257, 1958. [lo2] "Flying Saucer Occupants", book by Coral and Jim Lorenzen, Signet Books publisher, USA, pp 97-98, 1967. [lo1] "UFO - The Whole Story", book by Coral and Jim Lorenzen, The New American Library publishers, Signet Books, USA, pp 173-174, 1969. [jg1] "Black-Out Sur Les Soucoupes Volantes", book by Jimmy Guieu, Omnium Littéraire publisher, France, pp 225-226, 1972. [jv2] "Chronique des Apparitions Extra-Terrestres", traduction française de "Passport to Magonia", book by Jacques Vallée, J'Ai Lu publisher, France, pp 285-286, 1972. [gl1] "Face aux Extra-Terrestres", book by Charles Garreau and Raymond Lavier, Delarge publisher, J'ai Lu, France, pp 160-161, 1975. [cg2] "Les Débarquements d'Humanoïdes, article by Charles Garreau, in the History magazine Historia, France, special issue #46, page 73, January / March 1976. [bd1] "The UFO Register", compiled by J. Bernard Delaire, Data Research, U-K., Volume 7, parts 1 and 2, page 44, 1976. [fr1] "OVNI, Premier Dossier Complet des Rencontres Rapprochées en France", book by Michel Figuet and Jean Louis Ruchon, Alain Lefeuvre publisher, France, pp 187-188, 1979. [lg1] "The Fifth Horseman of the Apocalypse - UFOs: A History - 1954 October", monography by Loren E. Gross, USA, page 65, 1991. [re1] "Faces of the Visitors", book by Kevin Randle and Russ Estes, Fireside - Simon & Schuster publishers, USA, page 270, 1997. [kb1] "Enquête sur les Insaisissables - Tome 1", book by Fabrice Kircher and Dominique Becker, Ramuel publisher, France, page 42, 1998. [mp1] "Générations UFO", book by Michel Padrines, self-published, France, pp 124-125, December 2006. [gz1] "RR3 - Le Dossier des Rencontres du Troisième Type en France", book by Julien Gonzalez, Le Temps Présent publishers, France, page 148, 2014. 0.1 Patrick Gross December 29, 2003 First published. 1.0 Patrick Gross June 6, 2009 Conversion from HTML to XHTML Strict. First formal version. Additions [js1], [jb1], [lc2], [ud1]. 1.1 Patrick Gross December 21, 2009 Additions [jb2], [mp1]. 1.4 Patrick Gross July 14, 2010 Addition [sd1]. 1.5 Patrick Gross October 26, 2011 Addition [lo2]. 1.7 Patrick Gross October 9, 2014 Addition [ta1]. 1.8 Patrick Gross October 18, 2014 Addition [ni1]. 1.9 Patrick Gross December 15, 2016 Addition [gz1], [lg1], [ub1]. 2.1 Patrick Gross February 11, 2017 Addition [cg2]. Addition of the Notes. 2.2 Patrick Gross January 19, 2019 Additions [ce1], [bd1], [pr1], [mf3], [mf1], [re1], [lh1], [pr2]. In the Explanations, addition of "As of the observation, I can see no prosaic cause that could match what was described. The question of the credibility pf the report remains open. I have a hard time assessing it as for now I do not have the cited Press sources."